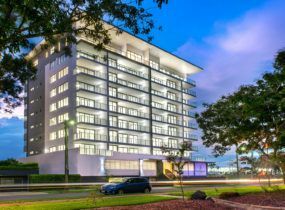 The award winning $200 million expansion of the town centre is revitalising the Narellan precinct by acting as a catalyst for further high-quality developments in the area. The public space at the heart of the project encompasses retail, reception, fireplace, lounge, bar, café, and library. 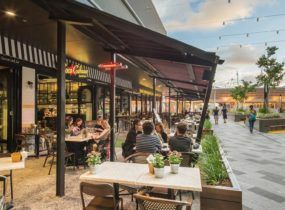 They spill onto the streetscape where canopies offer weather protection and landscaping integrates outdoor café seating. Materials for the project are simple and the colours are neutral to allow longevity. Large zones of glass create permeability in areas of pedestrian focus. In terms of standout features, the adjoining fashion-oriented sky bridge is the pinnacle of the centre’s extraordinary design. It links the north and south retail precincts seamlessly for shoppers. The process involved the consideration of international and local benchmarking to create a gateway landmark. The sweeping façade is set back from the busy roadway and adorned with hard and soft landscapes and water features that embrace the restaurant precinct and civic plaza. The expansion doubles the centre’s floor space. The completed additions make it the largest privately owned shopping centre in Australia.